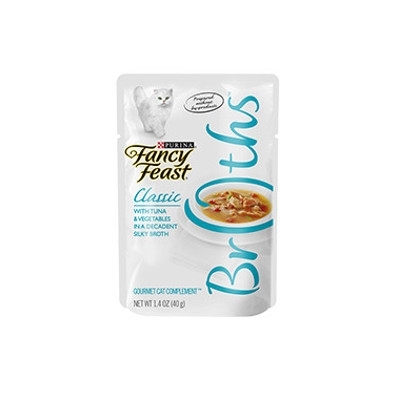 This Fancy Feast Classic Broths Variety Pack includes: Tuna, Shrimp & Whitefish; Tuna, Anchovies & WhiteFish, and Wild Salmon & Vegetables. Fancy Feast Classic Broth Tuna & Vegetables, 3 oz. 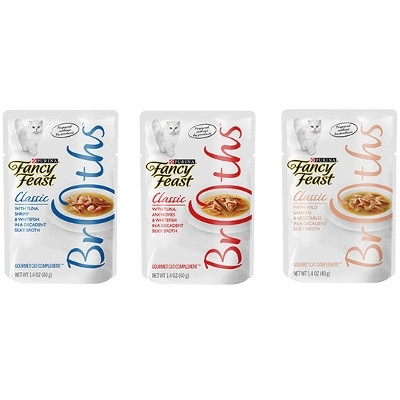 Fancy Feast's Classic Tuna & Vegetables is now in a savory, silky broth with delicious real tuna and vegetables, crafted without by-products or fillers.